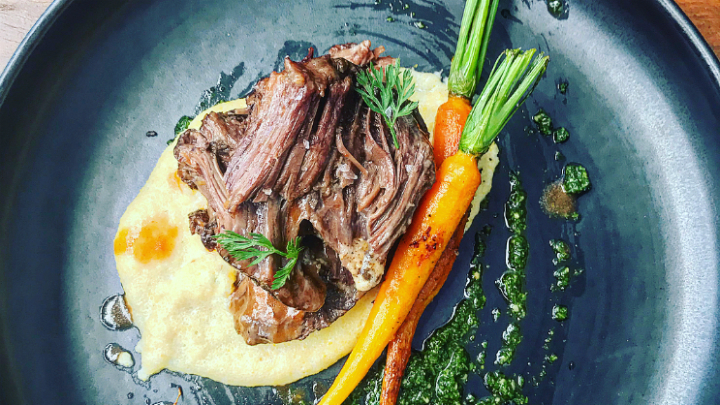 Beef cheek is a versatile, delicious, melt-in-your-mouth piece of meat that is best cooked slowly in order to break down the fat and connective tissue in the cut. In this recipe the cheek is braised (first fried to get a nice sear/crust on it, and then cooked slowly in a sealed dish). The time and love that needs to be put into the dish might seem a little daunting at first but the final outcome is totally worth it. Enjoy. Season beef cheeks and sear in dutch oven with 1 tbsp oil on medium to high heat for approx 4 minutes or until golden brown. Remove and leave on clean plate. In the same pan add 1 tbsp oil, red wine, stock, chilli, garlic, bay leaves, spices, tomato paste and tinned tomatoes. Bring to the boil. Add beef cheeks to liquid and top with water (if necessary) until cheeks are completely submerged. Cover the pot with a lid or foil and place in oven at 180°C for 3 hours. Remove from oven and remove cheeks from the pot. Skim any fat and reduce the liquid by half on medium heat. Adjust seasoning if necessary and add beef cheeks back to pot and leave on a low heat until ready to serve. Start to make the carrots and polenta now. Add 1L of milk, garlic and bay leaves to a medium saucepan and bring to a simmer on a medium heat. Remove bay leaves and slowly add polenta to milk. Stirring continuously, cook on a low heat for 3 minutes. Add butter, mascarpone, seasoning, parmesan and extra milk. Cook for another 2 minutes until polenta is a nice, semi-firm consistency. Toss carrots in olive oil and seasoning. Cook in the oven at 180°C for 8-10 minutes. Alternatively you can fry them on medium heat for 8-10 minutes. Toast pine nuts in a dry frying pan on low heat. Remove as soon as they start to go golden brown. Add pine nuts, kale, garlic, parmesan, seasoning and lemon juice to food processor. With the food processor on medium, gradually add oil until the ingredients are blended into a paste. Place a spoon of the polenta on the center of the plate. Using a slotted spoon and tongs gently place each beef cheek on top of the polenta and drizzle a little braising liquid over the top. Place some carrots next to the beef cheeks and spoon a little pesto over the top and alongside the carrots as shown in photo. When searing meat in a pan don’t crowd it. Cook them in batches if necessary. Using beef stock is ok but it will give you a richer dish. Be careful when toasting pine nuts as they will burn easily. Pesto will last for 3-4 days in the fridge and goes great with pasta, on a salad or in a sandwich. What’s the difference between Beef Taurus and Beef Indicus?